However, after reading Eat24's breakup letter to Facebook, it's hard to feel otherwise. By definition, a social network in the "offline" sense is a grouping of related individuals (through locality, blood, or less often, through common interest) from which ideas are shared and consumed. The more groupings a particular person is, the easier it is to maintain this relationship. After all, it is exponentially easier to go for coffee with a relative or a friend from high school than it is to meet up with someone in another continent who shares a common interest. This model translates online fairly easily: Your online social network is often a mimic of your offline social network. Services like Facebook make it easier to keep in touch with these members of your social network due to its online presence. Eat24's deletion of their Facebook page is one example of many who have made the leap -- and it's not an entirely surprising one! Your social network is exactly that, your social network. It doesn't have a guardian, or some algorithm that decides what gets through or not. 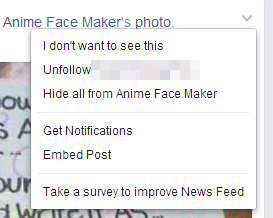 Facebook made a well-intentioned decision to filter your posts due to necessity, not due to some monetary reason. At first glance, filtering posts or altering the order of posts can be arguably beneficial: Less invitations to join Candy Crush, more pictures about peoples' food (if that's your thing). As is often with large companies, their bottom line interfered with their ideals. Promoted posts began showing up, and relevency became a black box with which you'd have to place your trust. As a consumer, you'd have to trust Facebook to deliver relevant news to you, and if you're somebody to creates content, you have to trust Facebook to deliver that content to your fans. People are losing trust in Facebook. Companies paying for likes and impressions are getting unwanted attention from robotic accounts, thus diluting their audience base, exacerbating the first point. Both content creators and consumers are realising that control of their experience on Facebook is diminishing. The creation of NodeBB may very well have been borne out of this frustration. The ability for a brand to have complete control over their consumer engagement is huge, and frankly, is something that Facebook was never all that good at. Likewise, the ability for a customer to be heard is another benefit. Facebook as a method of collaboration for those with common interest is becoming less and less true, and dare I say, closer to catering to its lowest common denominator of users posting cat memes and pictures of last night's dinner. This is what I like to tell detractors when they claim that forums are dead, or when they ask why forums are relevant given the pervasiveness of Facebook: The ability to have two people from around the world meet online simply because they share an interest, is something no social network can accomplish. * If they didn't, then they sure as hell popularised it!